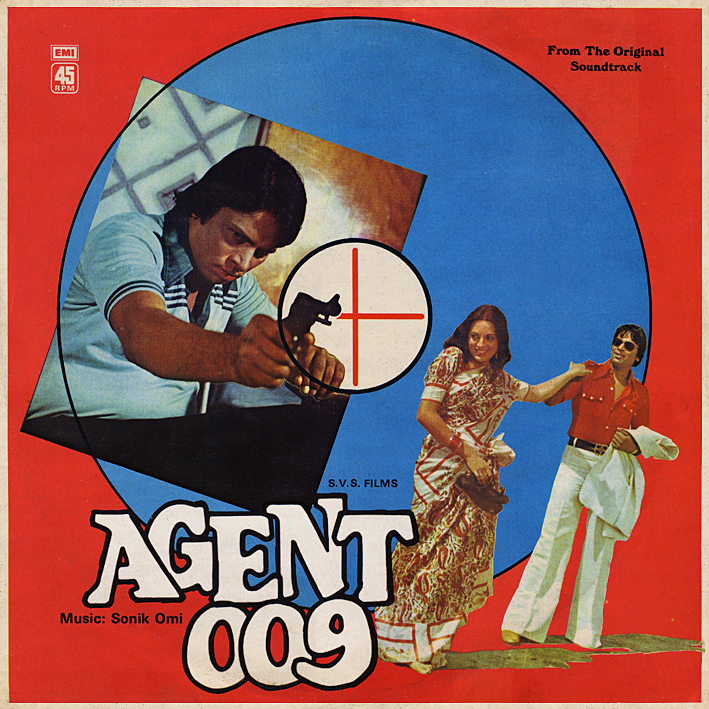 I have to confess that what initially drew me to 'Agent 009' was the title and the cover's mod-tinged spy imagery; I'm a sucker for that type of stuff. I was slightly curious as well though, to find out what Sonik Omi sounded like in the 80s, seeing as most of my other albums by them were made nearly 10 years prior. Surprisingly then, perhaps, there hadn't been much of a change. For better or worse, this soundtrack sounds a lot like a mid 70s RD Burman offering. No gratuitous display of modern technology, no disco beats; simply a quartet of nice poppy songs with plenty of cool instrumental features. The Burman influence is especially noticable on 'Aag Lagi Di Pani Men' and 'Maharaja Maharaja', yet for all it's derivativeness, I really like this score. Is it an obscure film? I couldn't find it on the IMDb, or anywhere. Great to see you back again so quickly with another post :) Thanks, PC. I searched and found that the movie is from 1980 and stars Vijendra Mittal, Rehana Sultan, Madhushal and Padma Khanna. Indeed, they're mentioned on the LP's back cover. Nothing about who directed it or anything else though. No YouTube links, hardly anything to be found on the net about it. Strange. PC Thank you very much for sharing. Yes Sonik Omi's essence of music very much resembles with Panchamda's music. this blog rocks. i follow it for a long long time. downloaded almost all the stuff. one of the best blogs ever seen. unfortunately i cant find Agent 009. big ups from Wrocław/POLAND. Only thing worse than Indian dealers and their overpriced trashed records, are Brazilian dealers, but i digress. Nice score on Doctor X, last one went for $350 on ebay, why must i cry.